An Industry Veteran Explains Why Gold Is Attractive Today, Though It Has Burned Investors Since 2012. Rob McEwen, the Chief Owner of McEwen Mining. (c) McEwen Mining. Used with permission. On March 22, 2018, I interviewed Rob McEwen to get his two cents (actually $8.5 billion). Rob is the Chief Owner of McEwen Mining and the former chairman and CEO of Goldcorp, a company he took from $500 million to over $8.5 billion in value, with a 31% annual compound growth rate during his tenure (yes, that beats Buffett). In his 20+ years in the industry, Rob has become a respected thought leader. He was appointed to the Order of Canada and is on the board of trustees for the X Prize. Source: Gold.org. © The World Gold Council. Used with permission. 2. Gold hit a high of $1,895 in September of 2011 – a month after Standard and Poor’s downgraded the U.S. credit (on August 5, 2011). On March 27, 2018, gold was trading for $1,343.70. 3. Gold ETfs. While gold is down 29% from its high, gold mining ETFs have taken a beating. Gold ETFs were the top sellers of gold since 2012, dumping more than 510 tons, while Russia and China went on a gold buying spree. The iShares MSCI global gold miners fund (symbol: RING) is down 64% from its 2012 highs. McEwen Mining (symbol: MUX) is trading at a discount of almost 80%. As you can see from the Top Holders of Gold chart, when you combine the market value of the Gold ETFs, they become the 6th top holder, ahead of China, Russia and Switzerland. Here are a few of the themes I explored with Rob McEwen. 6. How High Can Gold Go? Below are Rob’s comments… gleaned from the BlogTalkRadio show where I interviewed Rob McEwen last week. Click on the link to hear the full 51-minute conversation. Equities are expensive and commodities are cheap. We are at the lowest point since 1970 for commodities relative to equities. A lot of people talk about gold going down with interest rates rising, but Paul Volcker jammed Fed Fund rates over 16%, and gold ran all the way up to $850 [in 1980]. 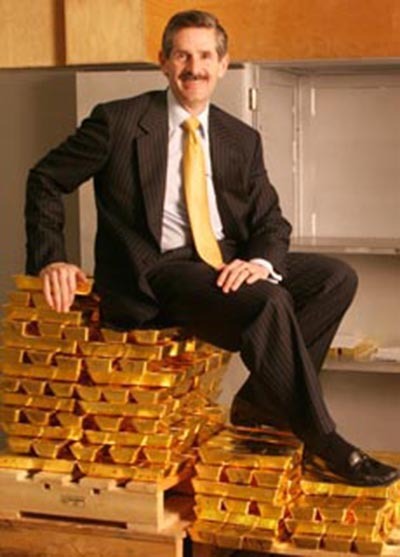 It was only when interest rates hit those very high levels that gold started turning around and going the other way. Cryptocurrency highlighted the amount of speculative money that is swirling around the world right now. Gold is priced on the world market, and has been accepted as money for a long time. Since 2012, the U.S. has seen gold prices off by about 30%. But if you were in Tokyo back at the end of 2011 close to the high, you’re not down 30%, you’re down 1%. In Canada and Australia, the mining companies are making good money now. ETFs have a very big impact on the market, both positive and negative. Markets are cyclical. There is a time and a place when you want to have precious metals, and a time and a place when you want to be in the broad market. I believe that the time to be into precious metals is now. My target for gold is $5,000/ounce. If you look at the cycle when President Nixon severed the link between the dollar and gold, gold ran from $40/ounce to $850/ounce. That’s a 20-fold increase. In this cycle, we could see a similar type move. Please note that my nest egg pie chart strategies, which earned gains in the Great Recession and have outperformed the bull markets in between, do not advocate market timing or jumping all in or all out of the stock market, and certainly not all into gold. If you’d like to learn more about my financial education and time-proven budgeting and investing strategies, call our offices at 310-430-2397.